Hold a warm cup of tea. Or coffee. Or hot chocolate. It doesn’t matter. Hold a warm cup, and as you savor the heat radiating into your hands, a wonderful sense of calm comes with it. Do this shortly before a presentation and you’ll get exactly the same reaction. Stress seems to mysteriously drain out of you. There is a whole lexicon of words such as “toasty” that evoke the pleasure of warm hands and feet, and there is a physiological reason why we’ve developed them. When we become nervous about something, presenting for example, one of the first physical symptoms is cold hands. As we enter fight or flight, our body diverts blood flow away from extremities such as the hands, and redirects it to the vital organs of the core. Because of this we develop the cold clammy hand sensation associated with presentation nerves. 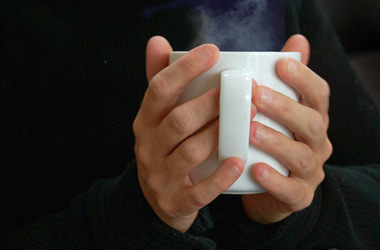 If cold hands represent a state of nervous tension, then warm hands represent the exact opposite: relaxation. When we have warm hands, the mind associates this with a state of calm and safety, hence all the snuggle type language we have referring to the pleasantness of warm paws. Knowing this, we can use a simple technique that I call “The Thawed Paws Pause” to trick our mental wiring into calmness pre-presentation. Next time you are going to present, accept the offer of a hot drink. The contents of the cup are of secondary importance, but if you have a choice, then my recommendation would be something that is caffeine-free. As your subconscious plays with this concept, the body starts to stand down some of the reactions we associate with presentation nerves, and a degree of those stage-fright jitters slip away. It’s a simple trick, and one of the earliest I was taught when I first started presenting. Next time you feel stressed or nervous, check the temperature of your hands. Icy? Take a moment to hold a warm cup. Feel tension melt into your thawed paws pause.